I often wonder what deeply held beliefs of modern times will be looked upon with laughter at some point in the future. Given the lessons of history, the passion in which certain beliefs are held is an interesting phenomenon. It is an understandable phenomenon given the need for an organizing structure to bring order and meaning to life. The existing reservoir of meaning-making content that serves as our belief systems spares us from the exhaustive process of analyzing data to understand and draw conclusions about each and every experience. This lens of perception through which we look upon the world is shaped by experience throughout life. Exposure to novel information has the potential to alter and widen this lens by expanding the pool of information available to make sense of our experiences. 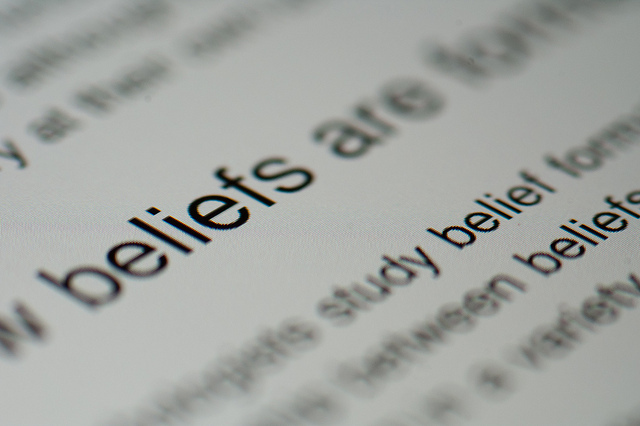 Though beliefs are amenable to change at all stages of development, we become less open to new ideas that may challenge existing beliefs as we age. The notion of being old and set in one’s ways is a statement of this reality. Exposure to new ideas that shake the foundation of deeply held beliefs results in a form of psychological discomfort known as dissonance. Often such moments are met with resistance but they are usually opportunities for growth and expansion. We avoid discomfort physically and psychologically; yet, it is through the discomfort of change that progress occurs. The same growing pains that accompany physical development occur as our belief systems develop and mature. To paraphrase, “when I was a child, I thought like a child. As an adult I put away childish ways.” I believe this statement speaks to the ongoing maturation process afforded us throughout the life span…if we are open. I had to put away the ways of my twenties to mature into the man I am in my forties. Many of the thoughts and beliefs of this decade will someday be looked upon as childish from the perspective of the sixty year old I will become. History is filled with pioneers who challenged antiquated systems of belief at the expense of ridicule, condemnation, and sometimes their lives. Were it not for those brave souls, we may still think the earth is flat or execute women for witchcraft. Were it not for those willing to challenge the conventional wisdom of their time, much of what we embrace in the modern day would not have come to pass. Individuals have always been faced with the question, “which side of history will you be on?” A select few dare and defy in service of advancing consciousness and a select few vehemently resist, holding on to archaic ways of thought and behavior. The majority are content with the status quo until a critical mass is reached and change takes place. Whether resistance manifests through denial or persecution, it is futile. Change is constant and progress is inevitable. The result is evolution. We live in a progressive Universe and the impulse toward expansion is a force that is ultimately beyond human control. It is the Divine forward moving current of life. We can swim against it or flow in alignment with it but sooner or later we will be swept away by it. Consider the areas of your life where you embrace growth and expansion and where you resist. In what aspects of your life are you being called to change, grow and evolve? What beliefs, whether about the larger society or yourself, are no longer in service to your joy, peace and wellbeing? This entry was posted in Psychology and tagged Belief, History, Philosophy, Psychology, Religion and Spirituality, Social Sciences, Star Trek. Bookmark the permalink.